"Lichtenberg ratio" redirects here. For √2, see Square root of 2. In 1786, the German scientist Georg Christoph Lichtenberg described the advantages of basing a paper size on an aspect ratio of √2 in a letter to Johann Beckmann. The formats that became ISO paper sizes A2, A3, B3, B4, and B5 were developed in France. They were listed in a 1798 law on taxation of publications that was based in part on page sizes. The main advantage of this system is its scaling. Rectangular paper with an aspect ratio of √2 has the unique property that, when cut or folded in half midway between its shorter sides, each half has the same √2 aspect ratio as the whole sheet before it was divided. Equivalently, if one lays two same-sized sheets paper with an aspect ratio of √2 side-by-side along their longer side, they form a larger rectangle with the aspect ratio of √2 and double the area of each individual sheet. The ISO system of paper sizes exploits these properties of the √2 aspect ratio. 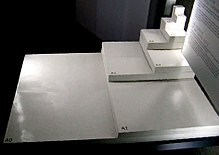 In each series of sizes (for example, series A), the largest size is numbered 0 (for example, A0), and each successive size (for example, A1, A2, etc.) has half the area of the preceding sheet and can be cut by halving the length of the preceding size sheet. The new measurement is rounded down to the nearest millimetre. A folded brochure can be made by using a sheet of the next larger size (for example, an A4 sheet is folded in half to make a brochure with size A5 pages. An office photocopier or printer can be designed to reduce a page from A4 to A5 or to enlarge a page from A4 to A3. Similarly, two sheets of A4 can be scaled down to fit one A4 sheet without excess empty paper. This system also simplifies calculating the weight of paper. Under ISO 536, paper's grammage is defined as a sheet's weight in grams (g) per area in square metres (abbreviated g/m2 or gsm). Since an A0 sheet has an area of 1 m2, its weight in grams is the same as its grammage. One can derive the grammage of other sizes by arithmetic division in g/m2. A standard A4 sheet made from 80 g/m2 paper weighs 5 g, as it is 1/16 (four halvings, ignoring rounding) of an A0 page. Thus the weight, and the associated postage rate, can be easily approximated by counting the number of sheets used. Paper in the A series format has an aspect ratio of √2 (≈ 1.414, when rounded). A0 is defined so that it has an area of 1 square metre before rounding to the nearest millimeter. 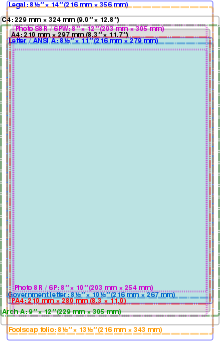 Successive paper sizes in the series (A1, A2, A3, etc.) are defined by halving the area of the preceding paper size and rounding down, so that the long side of A(n+1) is the same length as the short side of An. Hence, each next size is roughly half of the prior size. So, an A1 page can fit 2 A2 pages inside the same area. The geometric rationale for using the square root of 2 is to maintain the aspect ratio of each subsequent rectangle after cutting or folding an A-series sheet in half, perpendicular to the larger side. Given a rectangle with a longer side, x, and a shorter side, y, ensuring that its aspect ratio, x/y, will be the same as that of a rectangle half its size, y/x/2, which means that x/y = y/x/2, which reduces to x/y = √2; in other words, an aspect ratio of 1:√2. (brackets represent the floor function). The B series is defined in the standard as follows: "A subsidiary series of sizes is obtained by placing the geometrical means between adjacent sizes of the A series in sequence." The use of the geometric mean makes each step in size: B0, A0, B1, A1, B2 … smaller than the previous one by the same factor. 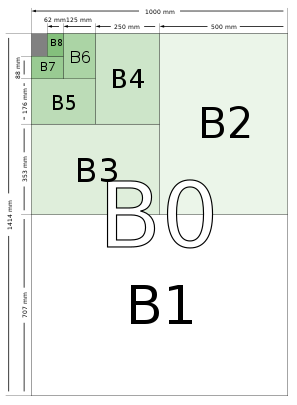 As with the A series, the lengths of the B series have the ratio √2, and folding one in half (and rounding down to the nearest millimeter) gives the next in the series. The shorter side of B0 is exactly 1 metre. There is also an incompatible Japanese B series which the JIS defines to have 1.5 times the area of the corresponding JIS A series (which is identical to the ISO A series). Thus, the lengths of JIS B series paper are √1.5 ≈ 1.22 times those of A-series paper. By comparison, the lengths of ISO B series paper are 4√2 ≈ 1.19 times those of A-series paper. The C series formats are geometric means between the B series and A series formats with the same number (e.g., C2 is the geometric mean between B2 and A2). The width to height ratio is √2 as in the A and B series. The C series formats are used mainly for envelopes. An unfolded A4 page will fit into a C4 envelope. C series envelopes follow the same ratio principle as the A series pages. For example, if an A4 page is folded in half so that it is A5 in size, it will fit into a C5 envelope (which will be the same size as a C4 envelope folded in half). The lengths of ISO C series paper are therefore 8√2 ≈ 1.09 times those of A-series paper. A, B, and C paper fit together as part of a geometric progression, with ratio of successive side lengths of 8√2, though there is no size half-way between Bn and A(n − 1): A4, C4, B4, "D4", A3, …; there is such a D-series in the Swedish extensions to the system. ±3.0 mm for dimensions above 600 mm. These are related to comparison between series A, B and C.
The ISO 216 formats are organized around the ratio 1:√2; two sheets next to each other together have the same ratio, sideways. In scaled photocopying, for example, two A4 sheets reduced to A5 size fit exactly onto one A4 sheet, and an A4 sheet in magnified size onto an A3 sheet; in each case, there is neither waste nor want. The principal countries not generally using the ISO paper sizes are the United States and Canada, which use North American paper sizes. Although they have also officially adopted the ISO 216 paper format, Mexico, Panama, Venezuela, Colombia, the Philippines, and Chile also use mostly U.S. paper sizes. 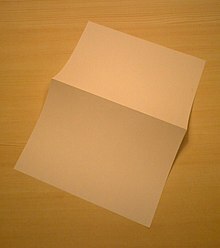 Rectangular sheets of paper with the ratio 1:√2 are popular in paper folding, such as origami, where they are sometimes called "A4 rectangles" or "silver rectangles". In other contexts, the term "silver rectangle" can also refer to a rectangle in the proportion 1:(1 + √2), known as the silver ratio. An important adjunct to the ISO paper sizes, particularly the A series, are the technical drawing line widths specified in ISO 128, and the matching technical pen widths of 0.13, 0.18, 0.25, 0.35, 0.5, 0.7, 1.0, 1.40, and 2.0 mm, as specified in ISO 9175-1. Color codes are assigned to each size to facilitate easy recognition by the drafter. These sizes increase by a factor of √2, so that particular pens can be used on particular sizes of paper, and then the next smaller or larger size can be used to continue the drawing after it has been reduced or enlarged, respectively. For example, a continuous thick line on A0 size paper shall be drawn with a 0.7 mm pen, the same line on A1 paper shall be drawn with a 0.5 mm pen, and finally on A2, A3, or A4 paper it shall be drawn with a 0.35 mm pen. The earlier DIN 6775 standard upon which ISO 9175-1 is based also specified a term and symbol for easy identification of pens and drawing templates compatible with the standard, called Micronorm, which may still be found on some technical drafting equipment. ^ Lichtenberg, Georg Christoph (February 7, 2006) [Written October 25, 1786]. "Lichtenberg's letter to Johann Beckmann" (in German and English). Translated by Kuhn, Markus. University of Cambridge. Retrieved May 10, 2016. Published in Lichtenberg, Georg Christoph (1990). Joost, Ulrich; Schöne, Albrecht, eds. Briefwechsel [Correspondence] (in German). Volume III (1785-1792). Munich: Beck. pp. 274–75. ISBN 3-406-30958-5. Retrieved May 10, 2016. ^ Kuhn, Markus (October 8, 2005). "Loi sur le timbre (No. 2136)" [Law of Taxation (No. 2136)]. Retrieved May 11, 2016. Kuhn includes copies of pages from the journal article that announced the law: Republic of France (November 3, 1798). "Loi sur le timbre (Nº 2136)". Bulletin des lois de la République (in French). Paris (237): 1–2. ^ "A Paper Sizes - A0, A1, A2, A3, A4, A5, A6, A7, A8, A9". papersizes.org. Retrieved 2018-08-02. ^ "International Paper Sizes, Dimensions, Format & Standards". PaperSize. Retrieved 2018-10-05. ^ "Japanese B Series Paper Size". Retrieved 2010-04-18. ^ Lister, David. "The A4 rectangle". The Lister List. England: British Origami Society. Retrieved 2009-05-06. ^ Kuhn, Markus. "International standard paper sizes". Retrieved 30 August 2017. ^ "Technical drawing pen sizes". Designing Buildings Wiki. Retrieved 30 August 2017. ^ Bell, Steven. "Pen Sizes and Line Types". Metrication.com. Retrieved 30 August 2017. Wikimedia Commons has media related to DIN EN ISO 216.